Three excellent Patriot tree shredders to choose from. First, I know what you might be thinking, “woodchipper is spelled incorrectly.” But the truth is, the the proper spelling of this device is either woodchipper or wood chipper — it’s not a spelling mistake, if that’s what you were thinking. It can be spelled either way. Have a look at how Wikipedia spells “woodchipper.” It’s also referred to as a tree shredder. Incidentally, you might like to know that Patriot products are actually made in the USA. A woodchipper is solely designed for one thing and one thing only — to transform wood into small woodchips. Typically they are designed to process tree trunks, leaves, and branches. Woodchippers are common in the agricultural industry for land maintenance and are also often commonly used to clean up after a storm. A tree shredder is comprised of many distinct parts, including a hopper, collar, chipper and a collection bin to make it easy to transport the wood chips. The wood is fed into the hopper, which acts as a safety mechanism to prevent serious injury to the operator. The wood is then transformed by the internal chipping system and the chips are then directed through a chute and into the collection bin. Tree shredders are typically powered by a combustion engine, but electric versions are becoming more common, such as the fantastic Patriot CSV-2515, which is in a class all by itself. Shredders can be used for a variety of industries and their usage and applications are quite diverse, such as for: arborists, landscape contractors, logging firms, rental stores, city workers, construction companies, just to name a few. High Torque Roller, which are electric powered, quiet and low-speed. Drum, which are driven by a motor-powered drum. The drum is situated parallel to the hopper and spins towards the output chute. These machines are extremely fast, noisy and dangerous. And because of the direct connection between the drum and engine, large materials can stall the engine while getting firmly stuck in the drum. In other words, this is not the type of woodchipper for homeowners. Disk, is based on technology that was created in 1922. In disc woodchippers, the wood is moved from the hopper by hydraulic wheels that draw the material toward the spinning disk (with attached blades). These blades are what cut the material into chips, which are then pushed out of the chute via drum flanges. Disk woodchippers are commonly used by tree care companies. Patriot is a highly reputable company that sells a solid line of gardening products – many of them have received accolades from independent reviewing institutions such as Consumer Digest. Patriot clearly has their aim on gas and electric woodchippers at the moment, but they also manufacture other products such as: lawn vacuums, gardening tools, and an extensive line of woodchipper accessories, like the Gator Grabber. Patriot got started in 1992 when five employees decided to start their own company after the organization they worked for, a lawn equipment company, was acquired. They set out on their own to build a better woodchipper, which would later become the core of the Patriot brand. The Patriot name was introduced in 2000, when they officially moved their head office and manufacturing facilities to Pewaukee, Wisconsin. The actual name of the company is Patriot Products Inc.
Patriot products are 100% American made. If you’re someone who wants to support American companies that hire and manufacture in the USA then Patriot is a company that you should be happy to buy from. Oh, did I mention the fact that they make excellent tree shredders, as validated by customer satisfaction and independent reviews. The three Patriot woodchippers in this article are all very well rated on Amazon: CSV-2515 (4.4/5), CSV-3065B (4.8/5), and their most powerful shredder, the CSV-3100B (4.7/5). If you read the reviews on these particular Patriot woodchippers you’ll quickly realize that these are well-made products that you should seriously consider if you’re looking for a quality tree shredder. Patriot CSV-2515: The best electric woodchipper for homeowners. The Patriot CSV-2515 electric woodchipper and leaf shredder is the most popular chipper in the Patriot product line, and for many good reasons. Perfect for shredding wood up to 2.5 inches in diameter, and also well-suited for shredding wet or dry leaves. Not all woodchippers are good with wet leaves so consider that a bonus. The size of the wood chips created will be about the size of a coin. 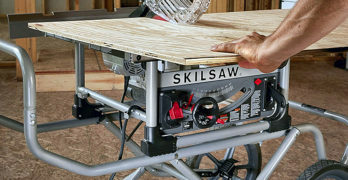 Powered by a 14-amp motor provides plenty of power for your home projects. Just plug it in, flip the switch and you’re ready to go. This is a great woodchipper if you’re someone who wants an easy-to-use, low maintenance tree shredder. This isn’t a commercial grade tree shredder so don’t expect it to handle wood over 2.5 inches in diameter. It won’t be as fast as either of the gas woodchippers on this list either. As I always stress: Figure out what your needs are, then buy the appropriate tool for the type of work you intend to do. You’ll need a 12 gauge extension cord so if you don’t already have one, pick it up at your local department store or order it online. Make sure it’s a 12-gauge cord. If you want to learn more extension cords then I suggest reading: Buying the right extension cord. Don’t piggy-back extension cords and don’t use an extension cord longer than 100 feet. Double insulated with individually insulated conductor. The Patriot CSV-2515 is fairly lightweight (for a woodchipper) at 95 lbs; making it easy to move around with its large wheels. The motor is rated at 1.5 hp, which is modest in terms of power. Just for comparison, the CSV-3065B and the CSV-3100B, gas woodchippers are rated at 6.5 hp and 10 hp, respectively. If you need a lot of power for heavy-duty tree shredding you’ll need to buy a gas woodchipper. Sorry, that’s just the way it is. The Patriot CSV-2515 electric chipper was rated by Consumers Digest as a “Best Buy” product in the summer of 2009, an honor given to less than 3% of the products reviewed. It has received the honor three times in total. Also, this woodchipper has received the tested seal of approval from the National Home Gardening Club Members. The CSV-2515 tree shredder is well supported by Patriot and they provide a full 2-year warranty. You also get a standard Patriot collection bag, and safety goggles as part of the package. This machine was designed for typical homeowners, meaning most people can handle the routine maintenance, saving homeowners time and money in the long-term. This is a durable electric woodchipper that you should seriously consider if you’re looking for a product that will stand the test of time. Size: 35 x 24 x 37 inches. Creates small chips for improved mulch. Quiet and less maintenance than gas chippers. Well-made with quality materials for durability. Easy to remove wood chipper knives for easy maintenance. lightweight and ergonomic makes it easy to move around the yard. Large wheels for increased mobility on varying terrain. Highly rated by independent organizations. Comes with safety goggles and chipper collection bags. Patriot CSV-306B: Highly durable commercial grade woodchipper. The CSV-3065B woodchipper is a big step-up in terms of power as this shredder is powered by a 6.5 hp Briggs and Stratton gas engine. This machine is best suited for chipping or shredding branches up to 3-inches in diameter. The CSV-3065B will handle a wide range of lawn debris, including: grass clippings, leaves, sticks, branches, pine-cones, and other vegetation in your yard. If you want to reduce your yard waste dramatically, by a ratio as high as 20:1, then you’ll love this commercial grade woodchipper. Throw in your branches and sticks and you’ll get coin sized wood pieces which you can then use on your plants and shrubs. If you don’t already know, wood chips are an excellent aid to prevent weed growth in your garden. Not just for wood, this unit is also excellent at swiftly shredding a large amount of leaves. Again, finely shredded leaves are great for mulch and composting as they are full of nutrients and minerals — an excellent way to recycle your yard debris in a truly sustainable manner by enabling you to add the shredded leaves to your soil. Your plants will be very happy. Designed with customers in mind, the CSV-3065B woodchipper has a convenient side discharge chute allowing you to send the material directly into a heavy-duty leaf collection bag. This handy design feature enables you to keep the shredder in one position, which translates to increased productivity. Basically, you can get more done in less time. I would say that most homeowners would appreciate not having to work longer than they have to. This is a solid tree shredder that has a few other features as it is a gas model, such as: low oil alert, a quality lo-tone muffler, and a one-pull start carburetor. Not to mention the fantastic 3-year warranty for homeowners and a 90 day warranty for commercial users. Patriot clearly stands behinds its products which is always nice to see. These are fairly expensive shredders but this is a commercial grade shredder that will get the job done and will pay for itself over time. Powerful 6.5 hp Briggs & Stratton engine. Ideal for branches up to 3-inches in diameter. Shreds or chips branches and vegetative matter into fine mulch. Easy to disassemble for maintenance reasons. Perfect for moderate-to-heavy wood chipping jobs. Patriot CSV-3100B: Fast and powerful. The Patriot CSV-3100B is built for speed and power. With a 10 hp engine this shredder will tear through branches, pine cones and leaves in no time at all. Perfect for trees up to 3-inches in diameter. This is a professional grade shredder made to quickly make mulch from any yard debris you toss inside, allowing you to work more efficiently without having to wait for the machine to catch up with you. With this unit you’ll have trouble keeping up with it. If you have a large yard, a farm or you’re a commercial property owner then this is a great choice to take care of all of your yard debris. Built with many great features, such as: Briggs & Stratton Vanguard engine, side chute, and overhead valve design for greater efficiency and cooler operation, to name a few. This is also quieter than most gas shredders due to its lo-tone muffler, and if you’re oil is running low this unit will let you know to prevent engine damage. This shredder was awarded top honors by the National Home Gardening Club, the editors of Consumers Digest magazine and the members of the Handyman Club of America. I have used the chipper 5 – 6 times and it performed as advertised and beyond, the knives are still sharp and pull the debris in just like the first day. I would be remiss if I didn’t recommend this machine to my friends. Briggs & Stratton 10hp Vanguard commercial engine. Quieter engine compared to other gas wood chippers. Shreds branches up to 3-inches in diameter in seconds. Made with high quality materials for durability. Which Patriot WoodChipper is Right for You? If you have a small yard and want the convenience of an electric woodshredder then there’s no debate about it, you’ll want the Patriot CSV-2515 for the sheer quiet and low maintenance features. But, if you have medium-to-heavy duty shredding to get done then you definitely need one of the commercial grade Patriot shredders (CSV-3065B or CSV-3100B) to handle the workload you intend to throw at it. Either way, Patriot is know for their woodchippers and they stand behind their products with great warranties and excellent customer service. Based on all the reviews and awards, I’d say that you can’t go wrong with any of these shredders. Happy shredding! Other than the Patriot Wood Chippers which have an excellent reputation, there are other options that will also satisfy your wood chipper needs. Some of these are heavy duty, while others are for light-duty mulching and shredding. Includes a 5-year warranty. Affordable high quality chipper/shredder. 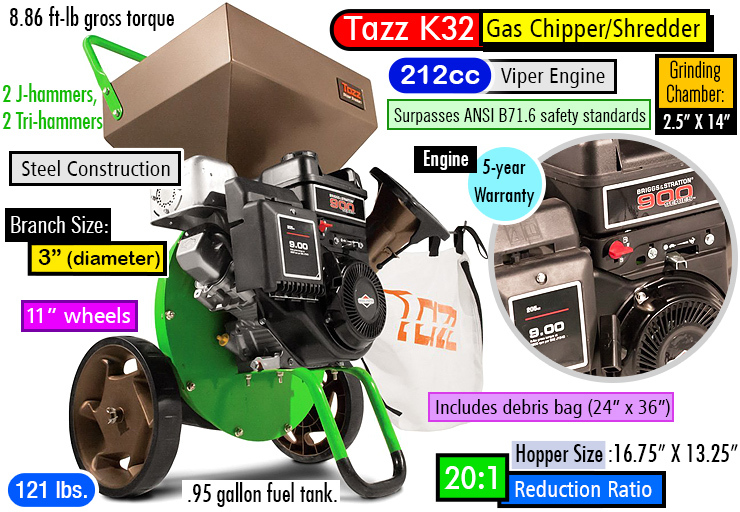 Note: We’ve covered the Tazz series of wood chippers/shredders in a separate article. These are a very affordable and well-made series of products that are well-worth your money. Engine Oil Capacity : 16.902 Fl. Oz. Ideal for turning branches and twigs into nutrient-rich garden mulch. 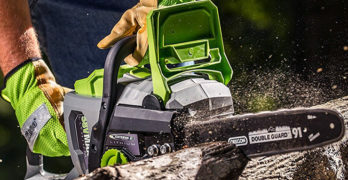 Powerful 14 amp motor effectively chips and shreds branches up to 1.5-inches thick. Compact design with 6-inch wheels for easy portability. Safety hopper with locking knob prevents the motor from operating when opened. ETL approved; Full 2-year warranty. Powerful enough to turn branches up to 3″ into mulch. A very powerful woodchipper that can handle heavy-duty tasks at home or on the job. Briggs & Stratton Intek IC 305cc Engine. 20 To 1 Reduction Ratio. Designed with Overload Motor Protection. This is a very popular woodchipper for homeowners. Comes with an extra cutting blade. The lightest woodchipper on this list so it’s best suited for your light-duty mulching needs around the yard. Feeds From The Top Or Side. 3 Cycle V-Blade Shredding And Mulching System. 14 Amp Electric motor. Quieter than gas. 10 To 1 Reduction Ratio. Includes A Tamper And An Extra Set Of Blades. Two 2″ Chipping Knives. 20 To 1 Reduction Ratio.